Small Curd Low Sodium Cottage Cheese - Healthy snacking doesn’t have to be boring or tasteless anymore. 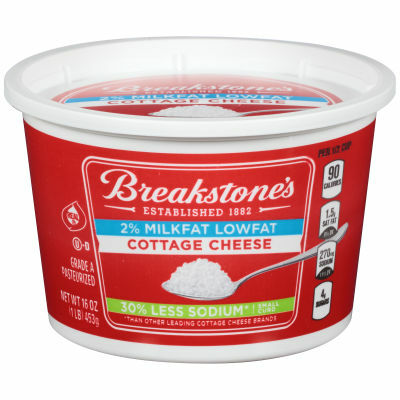 Add Breakstone's Small Curd Low Sodium Cottage Cheese to your meal and delight your taste buds. Low in sodium yet delicious in flavor, this tasty snack is a healthy option you’re sure to love. Guilt-Free Pleasure. Add Breakstone's Small Curd Low Sodium Cottage Cheese to your diet to make your meals extra delicious without piling up a lot of calories. Make low sodium desserts or savory snacks with this cottage cheese and enjoy the yummy flavor without worrying about the calorie count.